Nothing improves the appearance of a kitchen or bathroom quite like new floors. Our company has an excellent selection of tile flooring that breathes new life into your home. As part of the Flooring America family, we have the resources to offer the most competitive prices on all types of tile, including porcelain, ceramic, and slate tile flooring. We also offer tile flooring installation at extremely competitive prices. Right now, you can get $100 off any flooring purchase at our company, including premium ceramic tile flooring. This is a great opportunity to enjoy high-quality flooring at already low prices. Ceramic is an excellent material to use as flooring for bathrooms and kitchens because it is moisture resistant, scratch resistant, and easy to clean. These features also make them ideal choices for areas with heavy foot traffic, such as hallways, living rooms, and dining rooms. Maintaining your ceramic tile takes very little effort, especially if you apply a sealant after installation. The sealant adds another layer of protection that not only keeps water out, but it also makes the surface resistant to scratches and regular wear and tear from everyday use. At our flooring showroom, we have a diverse selection of ceramic tile flooring that comes in a multitude of sizes, shapes, and color patterns. Whether you are replacing the old tile in your bathroom or upgrading the linoleum in your kitchen to ceramic tile, you are sure to find the ideal flooring for your lifestyle, budget, and needs. Porcelain is made by heating up certain ceramic materials in a kiln at extremely high temperatures. This intense heat eliminates pores from the material, which is why porcelain is so strong and water resistant. The process also gives porcelain an attractive translucent appearance. 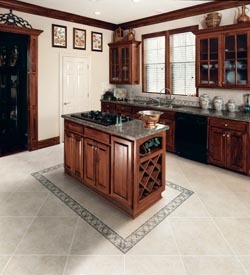 Porcelain tile is most popular for its blend of strength and beauty. It is difficult to scratch the surface of porcelain tile. So, with regular upkeep, you can expect it to retain its original appearance for many years. Many other types of flooring materials absorb water when exposed to moisture. Over time, this weakens the structural integrity and causes the materials to crack. Porcelain does not absorb water and therefore rarely cracks, even when used in areas such as bathrooms and kitchens where there is always a lot of moisture. Slate is a gorgeous, natural material that has been used for centuries for roofs, floors, and walls. This fine-grained, metamorphic rock is prized for its natural beauty, but the advantages go far beyond the aesthetic. Slate tile is highly resistant to water, making it perfect for bathroom and kitchen floors. It's also ideal for shower units, backsplashes, countertops, and other areas that are susceptible to splashes and spills. Make a wise choice by choosing slate for your floors. It is an economical and attractive option for many property owners. Your new floor will last for decades with only minimal care and maintenance. A slate floor can be a major selling point for a home and add significantly to your home’s value. Installing a tile floor is a complex task that requires specialized training and expertise. Our experienced installation team is more than up to the job. We combine proven techniques with the latest technologies to install flawless tile floors that stand the test of time. Each installation is completed to the highest standards, and we are proud of the quality of our work. As tile flooring installation experts, we have the ability to install any type of tile, from porcelain to slate. Warranties are available on all installations for your protection and peace of mind. Tile can be used to create a wide range of visually interesting designs. Instead of going for a basic grid, try a brick pattern that gives any property a unique, subway-style look. A checkerboard pattern adds a retro appearance to your home, and a tile border is a simple, elegant touch that gives any room a distinctive look. The possibilities are endless. You'll love working with our friendly, courteous tile flooring installation team. We strive to make every installation as easy and convenient as possible for you, your family, and everyone who come to your property. Flexible scheduling is available, and we work hard to deliver top-quality results along with fast turnaround times. Our managers and employees know that we are working in your personal space, so we make every effort to minimize inconvenience. We keep our work site safe and tidy, and we clean thoroughly before leaving your property. When we're done, you'll have a beautiful new floor that's built to last. Contact us today to speak with one of our floor specialists about our ceramic and porcelain tile floors. We proudly serve the communities of Mount Pleasant, Sullivan’s Island, Isle of Palms, Charleston, Daniel Island, Hanahan, South Carolina.